For most people reading about Ahmed Chalabi today after news of his passing, it will all be about the 2003 war, WMDs, and the neocons. However, there is much more to his story than that and I feel it deserves mentioning when discussing the man. The first period is perhaps his most notable contribution and what he will want to be remembered for. It was during this time that he became the organiser and leader of the exiled Iraqi opposition. He brought together a wide array of factions to work with his INC, including Islamists, ex-Baathists, communists, Kurds, secularists, nationalists, technocrats, and others. He supported relief efforts after the 1991 uprising, personally bankrolling several aid projects. He organised several key conferences of the Iraqi opposition during the 90s, and was the key proponent of the Iraqi Liberation Act of 1998 that Congress passed and Clinton signed. He brought Iraqi voices to the State Department, the White House, and other places that Iraqis desperately wanted to reach during Saddam’s time. He was key to the ceasefire in Kurdistan, convincing Barzani and Talabani to stop fighting each other. Several of Iraq’s post 2003 ministers and politicians owed their career to Ahmed, he brought them out of obscurity and pushed them into positions of power. He paid for opposition newspapers, journalists, writers, conferences that worked for regime change. He was a key figure in the December 2002 London conference that led to the Governing Council being formed after the war, and also formalised the sectarian/political quota system. But this was also the period where he was accused of defrauding the Petra Bank, of providing false intel to the Pentagon, of supporting by any means the neocon desire to remove Saddam. Ahmed, more than any other Iraqi, contributed to the fall of Saddam. The second period is when he hoped to realise his ambition, and at that time pretty much everybody, Iraqi and American, had expected Ahmed to become Prime Minister. It was his destiny and his reward. He was perfect for the part, the politicians owed him, there was no one else more deserving. Unfortunately for him the role he played pre-2003 was forgotten, and he was naïve to expect anything. He had little influence in the Iraqi street, no real power with which to impose himself. One term in the Governing Council was followed by the shock of Allawi’s appointment as interim PM rather than him. He was bitter at that, he began to lose friends in the Pentagon and State Department after the truth of the WMD claims began to come to light, and he found himself allying more closely with the Shia Islamists out of necessity, after pushing for debaathifcation immediately from Bremer’s time. 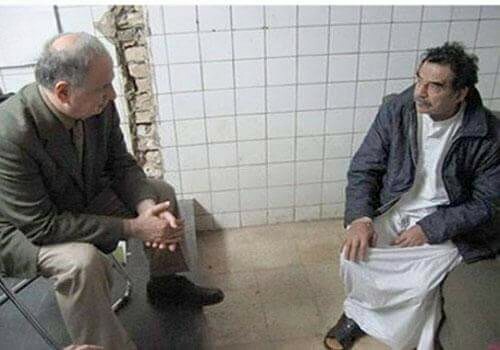 Called a liar in the US, a sectarian and corrupt Shiite in Iraq, he fully fell out of favour with the US after they suspected he was passing sensitive information to the Iranians (US troops ransacked his home and office in Baghdad). The accusations of corruptions were during the 2003-2004 period when Bremer was handing out billions in shrink-wrapped dollars to almost every major politician. Whenever talk of choosing a PM came about he was in the running, but it was not to be. The third period was his biggest disappointment, squeezed out by the Shia parties as he was never considered one of them, lacklustre results in elections, lack of support from any foreign country (including Iran), realising his ambitions at ruling Iraq were over, his trial by media in the US deciding his guilt in the WMD affair, and his dwindling role and influence in Iraqi politics. Every time the question of proposing a new PM came about he was inevitably mentioned as a candidate, but the hardnosed politicians knew he was never a real choice. Abandoned by all, the Iraqis, the Americans, he saw several of his INC seniors defect to others, and being overlooked for any top positions. During this time he was accused of corruption with regards to reconstruction contracts and the TBI fraud (his nephew ran the bank). It was in this period that the name Ahmed Chalabi meant the least in Iraqi politics. But he remained a patriot, and despite his faults, he wanted the best for his country. For those who still support the removal of Saddam, and are glad to see the back of the Baath party, then they should mourn Ahmed Chalabi and erect a statue for him. For those that do not, they will be glad to see his passing, another memory from 2003 to be forgotten. For the majority of Iraq’s people, his death will not mean much, a name of someone that they didn’t really know or identify with. It is a story of failed ambition. This entry was posted in Iraq and tagged ahmed, chalabi, iraq. Bookmark the permalink.